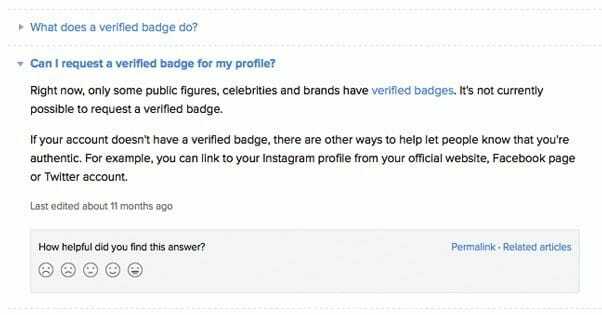 What is a verified badge on Instagram? It’s a little checkmark, blue as it is on almost every network, next to the user’s name in search and in their profile. The only accounts that can be verified are those representing well known public figures, celebrities, and “global brands” on Instagram. Instagram’s first priority is to crack down on fake profiles and make sure nobody’s pictures are used to catfish other people. Unfortunately unlike the generous Tinder and Facebook, Instagram won’t actually let you directly ask for a blue tick. Their stuffy statement on verified account reads: “Right now, only some public figures, celebrities and brands have verified badges. It’s not currently possible to request a verified badge. Short of making yourself somehow internet famous, getting your pictures stolen might be the only way to get a blue tick if you’re not a celebrity. If this is you, the place to go is here – Instagram’s page for helping people who are being impersonated. Unfortunately it would probably take quite a few catfishing attempts before they would hand out a blue tick to someone who isn’t famous.